Along with these colourful magazines from the 1930s, the Chinese rare material includes 7000 publications dating from the 1600s to 1935, as well as scrolls of painting and calligraphy and diaries from the Cultural Revolution period. The Japanese rare collections contain books about history, art, architecture and language learning, and unusual items such as pamphlets and booklets advising the population on how to prepare for the American air raids in World War II. For information and access see www.unimelb.edu.au/culturalcollections/collections/eastasian.html#eastasian. Pictured: Arts & Life, no. 39, K. & K. Printing Co., June 1937, East Asian Collection, University of Melbourne. The University’s Grainger Museum holds more than 100,000 archives and artefacts. Newly refurbished, the Museum is open to the public and is well worth visiting for a look into the highly creative, eclectic and unusual life of the Australian-born composer and pianist Percy Grainger (1882-1961). For opening times and more information see www.grainger.unimelb.edu.au. Excitingly, this year’s City of London Festival, which is on this week, features an exhibition, lectures and a performance relating to Percy Grainger as a composer and musician. The exhibition focuses on the time that Percy lived in London in the early 20th century, and shows how significant he was in the social and artistic life of the city. For all of the details see www.colf.org/whats-on.cfm. Above: Lee McRae, photographer, Interior of the Grainger Museum showing the towelling outfit made by Percy Grainger, c.1934, out of a bath mat and towels, 2010, Grainger Museum collection, University of Melbourne; above right: Aimé Dupont, photographer, Cordially Yrs Percy Grainger, 1917, Grainger Museum collection, University of Melbourne. Above: Women medical students, University of Melbourne, 1887, photographer unknown, University of Melbourne Archives (UMA/I/2003). George McArthur (1842-1903) was born in Scotland and immigrated to Victoria with his family in 1852, moving to Maldon two years later at the height of the Gold Rush. Bookish from an early age and later a keen traveller, he collected widely, including early printed books, religious texts and Scottish poetry, as well as material from Australia’s early colonial times such as newspapers, handbills, miner’s licences and artefacts. Being friendly with, and impressed by one John Walter Gregory, Professor of Geology at the University of Melbourne, McArthur decided to leave his book collection to the University. His bequest, which at the time in 1903, represented nearly ten percent of the Library’s total book stock, later became the basis for the Library’s Special Collections. An exhibition, ‘The Baker of Maldon’, commemorating 100 years since this significant bequest, was held in 2003. The catalogue essay describing McArthur’s interesting life can be read in the Special Collections reading room, 3rd floor, Baillieu Library. See http://cat.lib.unimelb.edu.au/search/t?SEARCH=baker+of+Maldon. Pictured: Title page of Sir Walter Raleigh, History of the World, London: Printed for Walter Burre, 1614. From the George McArthur Bequest, 1903. Special Collections, University of Melbourne Library. To celebrate Naidoc Week, we’ve found an artwork by Tommy McRae, a Kwatkwat man. Tommy was born c.1836 near Wahgunyah on the eve of white settlement and Aboriginal dispossession. When young, he worked stock for settlers such as John Ford as well as doing seasonal work, fishing and hunting for family and trading purposes. Presumed to be the same stockman known in neighbouring parts as Yakaduna or Tommy Barnes, he also possessed a valuable artistic talent. Observed drawing with a stick on the Murray mudflats, McRae was provided with pen, ink and paper by Wahgunyah postmaster Roderick Kilborn and other settlers, who were said to pay ten shillings for a filled sketchbook. McRae achieved some standing through his talent and his ability to make a partial living from it. Working from memory or oral tradition, McRae executed his ink silhouettes lying propped on one elbow, drawing from the foot of his subject matter upwards, often arranging the narrative drawing in several tiers. Accomplished in draftsmanship and animation, he invested his compositions with great verve, drama and not a little humour, often lampooning an upstart squattocracy. By the 1880s the McRae family had established camp at Lake Moodemere, periodically ‘going bush’ in a wagonette, but when it became an Aboriginal protection reserve in 1891, they moved across the river to avoid seizure of their children. Circumstances forced a return and the loss of the children, and McRae died within a few years. 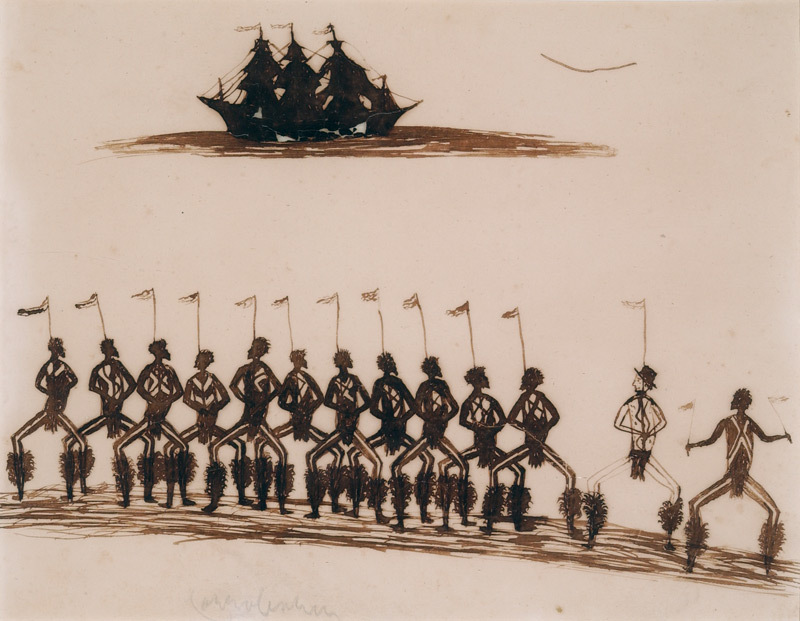 Above: Tommy McRae, ‘Corroboree’, c.1890, ink on paper, Foord Family Collection (1961.0008), University of Melbourne Archives.